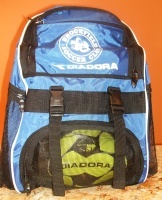 Click for larger image Brookfield Soccer Club BACKPACKS are available for purchase at Play It Again Sports! This backpack is designed to hold all of your gear for practice and game days. Features 420 denier durable nylon with PVC backing. Front vented zippered ball pocket, side vented shoe tunnel, and side vented accessory pocket keep everything well organized. Front straps provide an extra place to attached your jacket, while padded anatomically shaped shoulder straps offer a comfortable feel while carrying. Players may seek a local vendor to have their player number and/or name printed at an additional fee (this service is not provided by Play It Again Sports). Backpacks are in stock at the store - no need to order in advance. Any questions, please visit or call the store - 203-775-0577.